The Ornate Horned Frogs range is the Pampas region of Argentina, Uruguay, and Rio Grande do Sal, Brazil. Ornate Horned Frogs are usually found near rivers and swamps; some arid regions. Ornate Horned Frogs lay eggs which hatch into tadpoles in 18 hours. Ornate Horned Frogs lie in ambush in mud or under leaves, concealed by camouflage, and will snap at any prey as it approaches. Even the tadpoles are predatory from the start, attacking other small animals. They like to fight, and if disturbed will attack larger animals and will even snap at humans if they try to handle them. They are able to resist droughts by burrowing in mud and forming a cocoon around their bodies by shedding several layers of their outer skin. The loose skin will still surround the frog, helping them to keep damp until the drought ends. 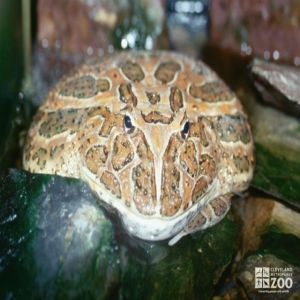 Ornate Horned Frogs engage in a process called Amplexus which lasts from 1 to 4 hours, with the female depositing a tennis ball-sized clump of 200 to 1,000 1.3 millimeter eggs, which hatch in about 18 hours. The tadpoles grow quickly and are carnivorous from the start, moving in swarms to overwhelm other aquatic creatures. After 20 to 32 days the first 2-centimeter froglets begin to emerge.